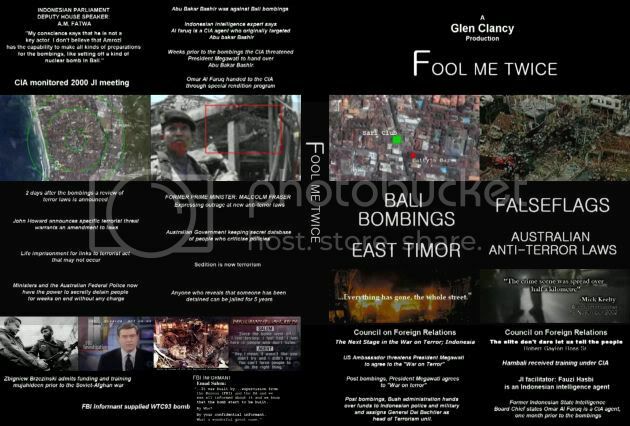 This well-crafted, well-documented film from Australia exposes the 2002 Bali Bombings as yet another case of False Flag Terror. Using a formula that has worked so well for the Loose Change crew, the filmmaker has crafted a very watchable piece that flows well, with interesting visuals, a soundtrack that moves from hip to emotionally engaging, and most importantly, and most damaging of all to the powers that be... the Truth. "Fool Me Twice" examines well-known examples of False Flag terror, and adds an excellent new sequence about the 1993 World Trade Center bombing that leaves the viewer with no doubt that Emad Salem was a controlled asset. Utilizing audio that features Salem covertly recorded while talking with FBI agent John Anticev, "Fool Me Twice" cuts to the chase regarding the 1993 bombing, and goes deeper, examining the CIA's links to this milieu. The film closely examines the Jemaah Islamiyah and it's links to the CIA and other intelligence agencies that used this radical group. A very welcome and valuable analysis. This film reveals extensive connections between JI, the Bali Bombings and military and intelligence circles. I rank this film among the most important and valuable of the year, packed with valuable information, bolstered by new analyses, and accompanied by a familiar pattern: violent extremists are targeted, infiltrated, aided, and ultimately directed by the very intelligence services that should be protecting innocent civilians from the extremists. The Bali bombings were used to usher in tons of "anti-terror" legislation in Australia. Highly recommended viewing. 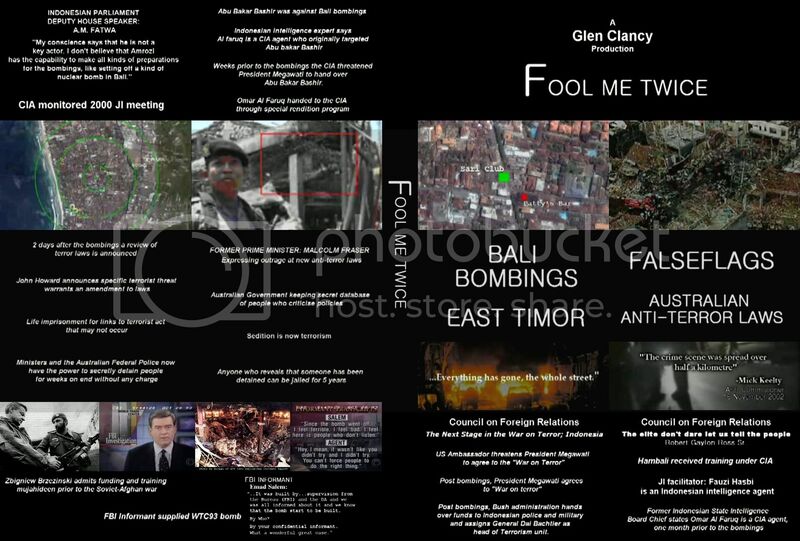 Released on Youtube and Googlevideo this week, FOOL ME TWICE, exposes the cover-up of the Bali bombings and provides evidence that it was a Falseflag Operation. The film begins by documenting the Australian government’s prior knowledge of the Indonesian military’s plan to use violence to maintain autonomy over East Timor. Contrary to The Howard Governments claims they argued against peacekeeping forces allowing the Indonesian Special Forces to carry out their campaign of fear and suppression. Within 24 hours of the 2002 Bali bombings a team of FBI, UK special agents and Australian federal police started arriving in Bali. The investigation team continuously claimed different explosive devices were responsible for the main blast. Days after the attacks, Indonesian Police Chief, General Dai’ Bachtier, announced that the FBI had discovered C4 pointing the blame towards Jemaah Islamiah, JI (“SE Asia wing of Al qaeda”). Eventually, investigators concluded that the main explosive device was a potassium chlorate car bomb. C4 was never included in final reports. The main explosive device was so powerful it seriously damaged buildings in a 2/400 metre radius and left a 1 metre deep, 10 metre wide crater. 202 people perished in the blasts, the majority incinerated from the main explosive device. Investigators quickly excavated the crater contents and dumped the remaining debris off the coast of southern Bali, including completely stripped concrete reinforcing bars. Potassium chlorate is a low velocity explosive and does not have the overpressure force to create a 1 metre deep crater or completely incinerate humans, let alone strip concrete. Only a high-tech explosive device has the power to strip concrete. FBI claims of C4 announced by General Dai’ Bachtier, ensured Jemaah Islamiah was immediately blamed for the Bali bombings. All prior intelligence of the Bali bombings came from so called JI leader, Omar Al-Faruq. Omar Al-Faruq was secretly handed over to the US by Indonesia months prior to the bombings under the CIA’s extraordinary rendition program. Australian intelligence agencies reported that intelligence obtained from captured “JI suspect”, Omar Al-Faruq, warned of possible terrorist attacks in Bali. After the attacks the Bush administration denied access to Al-Faruq for questioning in the Bali bombing trials. When Omar Al-Faruq was suddenly called by US court to provide evidence in a trial of another terrorist suspect – he had “escaped high security prison”. No JI leaders have ever been brought to trial. Prior to the Bali bombings the Indonesian government denied the existence of terrorists within Indonesia and opposed US anti-terror operations in Afghanistan. After the bombings President Megawati signed a joint statement – “Agreeing that terrorism poses a continued threat to international peace and security, and that the two Presidents are committed to enhancing their bilateral cooperation in the fight against terrorism”. The Bush administration provided funds to the Indonesian police and military and setup a national terrorism unit under the control of national police chief, General Dai’ Bachtier. tomorrow a.m. Am burning a bunch of LCFC to pass out to our first 911 meeting in our town. From your description, the movie appears to document the archetypal false flag. And its inclusion of the 93 WTC bombing is yet another example that doesn't get enough exposure. medicis on Fri, 12/07/2007 - 11:00pm. Where can I find a higher resolution copy? Jumbo Jets Can Not Demolish Skyscrapers. jkeogh on Sat, 12/08/2007 - 2:57am. The maker of the film never planned to sell DVDs, but there is demand. Get your order in early! Reprehensor on Sat, 12/08/2007 - 8:31pm. imgstacke on Sat, 12/08/2007 - 5:46am. the maker of this documentary has done in one scoop what should have been done years ago! alex and the loosechange crew would be hard pressed to equal this effort! my children are not cannon fodder for the n.w.o. able on Sat, 12/08/2007 - 9:24am. Good thing Australia finally booted ex PM J. Howard. I think your previous government was integral to the Bali bombing coverup. Hopefully your new gov't will be less willing to connive with the perps who did this for their global agenda. I come from the Philippines, and I found out to my horror that some of the terrorist bombings in my country (which were blamed on Islamic militants) may have involved US spooks as well, and this was with tacit approval and support from our own government. The WTC was destroyed by controlled demo-http://www.ae911truth. juandelacruz2 on Sat, 12/08/2007 - 10:35am. Investigators and forensics experts from both national and international teams that had quickly been assembled flocked to the crime scene, ostensibly to begin what should have been a long, drawn out exercise in forensics and investigative sleuthing to identify and capture the foot soldiers, coordinators and masterminds behind the attack that has left over 190 known dead, scores missing without a trace and hundreds more wounded. It has turned out to be anything but that. The Indonesian government immediately vowed to unite in the hunt for the bombers. The U.S. government along with the international community seized the opportunity to point the finger at the shadowy al-Qaeda group along with Muslim cleric Abu Bakar Ba'asyir as the culprits. In hindsight, it would appear that perhaps these individuals, given their apparent intimate knowledge of the perpetrators immediately following the bombing should have been included on the investigating team. Perhaps if they had we would know more than we do today, which is very little despite the volume of information (or disinformation) being vomited out by the spokesmen for the investigative teams on a daily basis. A creeping sense of foreboding began soon after the forensics people and other investigators (inclusive of Insp. Gen. I Made Pastika and his army of hundreds of supposedly top-notch investigators with virtually unlimited resources at their disposal) announced after only a week and a half that they were wrapping up their on-site work and retreating to the labs to analyze their findings. Astounding work, as it must have set a world record for crime scene forensic analysis. Given the scope of the bombing and the sheer size of the primary and secondary blast areas - where trace from a plethora of different explosive compounds were swabbed from - this was a feat that escaped even the vaunted investigators working the World Trade Center crime scene in New York, who spent nearly a year literally sifting by hand for evidence at the site. It would appear that the teams on Bali possessed far superior skills and techniques ... or was there something else responsible for their haste in wrapping up so quickly and then sending the rest of the evidence as quickly as possible to the bottom of the ocean off Bali? At this point in their investigation National Police Chief Gen. Da'i Bachtiar states for the record that "traces of a chemical powder used in the bomb" were found in the van allegedly used to transport the large device. What powder? Even a cursory examination of the crater and primary site immediately following the bombings would make this statement laughable were it not for the circumstances. If indeed the Mitsubishi L300 van was used in the large blast, the five-foot deep by twenty-foot wide crater indicates that it would have been completely vaporized, including the engine block which they apparently found intact - along with the victims who instantly vanished. Indeed, this begs the question: Where did the investigators obtain this evidence in relation to the crater? Is it possible that if the van survived the large blast it was because it was parked at the edge of the primary blast zone, packed with small amounts of all the explosives - whose traces were found at the sites - in order to throw off independent investigators? In addition, there is the Memorandum of Understanding (MoU), allegedly signed jointly by the National Police and the international investigation team, specifically restricting the scope of the "investigation links" and prohibiting international inquiries. Could this at least partially explain why Pastika has continually stonewalled, intimidated and generally obstructed independent investigators during the course of their work? During the first weeks of the investigation, notables such as State Intelligence Agency (BIN) Chief Hendropriyono, Susilo Yudhoyono, Assembly Speaker Amien Rais and Pastika focused or pretended to focus on foreigners - without specifying "which" foreigners - who they said were behind the attack. Somehow this twisting, turning trail dried up and disappeared into thin air without explanation, along with the former retired Air Force Officer who allegedly confessed to police his involvement in the bombing and was then released. To this day his whereabouts remain unknown and police investigators either cannot or will not release any information on this man, an officer who was allegedly trained in America in explosives and is an incredible lead that should have been followed-up on aggressively and thoroughly. Why was it not? Are these the statements and actions of professional investigators - or the actions of individuals engaged in a cover-up? Let's look at the myriad of explosive traces found at the site and subsequently cited individually off and on by investigators and police as "the explosive" used in the bombings. First it was C-4, then RDX. These two are actually the same, the difference being nine percent mallable plastic used in C-4. So, which is more powerful? RDX - nine percent more powerful than C-4. Day after day, investigators trotted out a different explosive and combinations of explosives purportedly responsible for the blasts. In addition to C-4 and RDX there was now TNT, Ammonium Nitrate, HMX, Semtex, PETN, Chlorate and napalm. Everything but the kitchen sink. Was this gross ineptitude? Or another ploy to throw independent investigators off the trail? For example, had the originators of the napalm theory studied up on the material before opening their mouths they would have known that napalm leaves a sticky, smelly residue on everything, including victims. This was not in evidence at the blast site or at the Sanglah burn ward and morgue, where the burn victims were taken. Therefore, in the absence of any physical evidence, napalm must be excluded and the originators of this farce be awarded a grade of "F" in "explosives analysis." In other words, if you are going to lie, be professional about it at least know what you are lying about and have the mental capacity to remember what you said when you said it. This single evidentiary template could easily be applied and extended to the entire "official investigation" of the Bali bombings where deceit, obstruction and obfuscation are and have been the name of the game. To put this in perspective, let us look at three of the explosives claimed by official investigators to have been used in the bombings, starting with the compound that has the lowest velocity of detonation in feet per second (FPS) which is Potassium Chlorate at 3,500 FPS; compared to 12,000 FPS for Ammonium Nitrate and diesel and finally 27,800 FPS for RDX. In simple terms, at any given distance from ground zero these different explosive compounds will exert pressure in pounds per square inch. Damage to people and structures are a result of this pressure in varying degrees depending on the velocity of detonation. Even if RDX were used, the amount needed to cause the level of destruction in evidence at the crime scene should have been in excess of anything available through even the military, who denied possession of the explosive. There is also the delivery of the device to be taken into account. Each of the explosives cited by investigators (with the exception of napalm) have unique and individual characteristics that vary for usage, stability and explosive yield. They require specific detonators for each in order to obtain maximum effect. Also now at the bottom of the ocean off Bali is the reinforcing bar (rebar) located more than fifty feet from ground zero that had been completely stripped of concrete as a result of the blast. Documented military estimates of the force required to accomplish this is roughly 1 million to 1.5 million pounds per square inch. What kind of weapon or device could accomplish this? And for that matter leave a crater of that size? Why was it filled in? This arguably could have been one of the most important pieces of evidence available to investigators not only for the trace explosive in evidence, but from which also could have been determined (roughly) the size and composition of the device. With the police claiming (off and on) that Amrozi, Mukhlas and Samudra (who allegedly at one point denied involvement in the Bali bombings) were the perpetrators of the blasts, then why do the official investigators not know EXACTLY the type of device used in the main bombing and its precise composition? To put it quite simply, how can we have a bomber or bombers in the absence of a bomb? Why were Amrozi and Samudra so quick to confess and finger their "accomplices"? Were these the actions of dedicated, radical, Islamic fundamentalists? "Professionals"? Did they expect to further their cause by eviscerating their own organization? Does it make sense that they were willing to kill and maim hundreds of innocents - including many fellow Indonesians - and yet implicate their comrades to save their own skins? Given this dismal investigative performance, exactly what role did the international investigating team play in this debacle? If indeed there is one thing that has been glaringly apparent throughout this investigation, it is that perhaps nothing close to the truth has been told as of today. It is also apparent that something is very, very wrong not only with the procedural aspects of this case, but also with the suppression and outright destruction of evidence. The international investigators bear a heavy responsibility for this, and should be held accountable. Jakarta Post Editor Robert S. Finnegan is an internationally published investigative reporter with over two decades investigative experience. He currently holds an Alaska (U.S.) Private Investigator license. brianct on Sat, 12/08/2007 - 5:55pm. how to contact Rober Finnegan? medicis on Sat, 12/08/2007 - 10:16pm. medicis on Sat, 12/08/2007 - 10:17pm. seem to be of the same mold. The War on Terror is an international fraud, designed to take away civil liberties and establish police state governments throughout the world. These terror incidents all seem to share a lot in common. The grossly overpowered bomb that was used in Bali reminded me of the bomb used in OKC, or WTC93, downplayed to be a homemade, unsophisticated bomb that could not have done that kind of damage. The same terrorists who were intelligence informants/assets, some killed to keep them quiet. Great documentary. It's interesting to learn about what other false flag operations have occurred in other countries, from the perspective of people in those other countries. Makes you realize that we're truly all in this fight for truth together. benthere on Sun, 12/09/2007 - 2:35am. 2. 2002 Davao City, Philippines - where a device brought into a hotel room by Michael Meiring exploded and seriously injured him, he was very quickly evacuated out of the country by the US FBI before the matter could be properly investigated. At the time, there were several bombings in and around Davao including the airport terminal that were blamed on Abu Sayyaf, an Islamic militant group. juandelacruz2 on Sun, 12/09/2007 - 9:25am. Has there been made a documentary about the Madrid bombings? Terrorstorm had a little segment about it, that's all I know of. the911fields on Mon, 12/10/2007 - 2:51am. the production is decent. but some of the dialog and details seem to be a bit confusing. not very clear. maybe it's my bad attention span and lots of details, but it wasn't as easy to follow as most other documentaries. i noticed that there was some obvious hinting towards use of a mini-nuke as what the bomb actually was. the included sources is a good thing, but some of those sources are questionable. "The most perfidious way of harming a cause consists of defending it deliberately with faulty arguments." Thrashaero on Sun, 12/09/2007 - 4:56pm. The music is a bit distracting, but other than that, I think, this is a very thought-provoking and powerful film. Thanks for posting it. borepstein on Sun, 12/09/2007 - 10:42pm. the911fields on Mon, 12/10/2007 - 3:04am. sector on Thu, 12/20/2007 - 4:21pm. here are the rapidshare links for "fool me twice". please repost these links wherever you think they will be useful. Frank Valentine on Fri, 12/21/2007 - 7:07am. Compiled from the 13 files linked above. jkeogh on Wed, 02/20/2008 - 12:06am. Where did Robert Finnegan get this? "even the vaunted investigators working the World Trade Center crime scene in New York, who spent nearly a year literally sifting by hand for evidence at the site"
I thought the WTC investigations weren't quite that meticulous. Vesa on Fri, 12/21/2007 - 11:24am. 90% of this movie seemed great to me, but the suggestion that some sort of tactical nuke was used in the Bali bombings really threw me. Does anyone know if the film's creators think a tacnuke was used on 9/11? Bush's GOD is Gold, Oil, and Drugs. operator kos on Mon, 02/04/2008 - 1:53pm.